Imagine a group that commits these violent and illegal acts existed in your country. I dare anyone to tell me that this is not terrorism. I am not saying that everyone in the pro-Morsi camp is a terrorist. Some are peaceful political protestors that have the legitimate right to demonstrate and be heard. But the Muslim Brotherhood along with other fundamentalist Islamic groups ARE terrorist groups. If the Boston bombers, who only killed 3 people are labelled as terrorists, then how is the Muslim Brotherhood, which regularly attacks and kills Copts and Shiites not a terrorist group? Why are individuals and groups only identified as terrorists when they are extremist Muslims in the west. WE HAVE EXTREMIST MUSLIMS TOO. And they are just as willing to kill their own people as they are to kill westerners. Their enemies are not just westerners. They’re Christians and Shiites and Atheists and Jews and basically anyone they consider an infidel. Which, by the way, includes Muslims that don’t share the exact same interpretation of Islam as they do. This is a terrorist group. So, yes. I am highly critical of claims that they were peaceful demonstrators that were massacred by the army. They were not peaceful. They are a violent and a provocative group. And whenever you hear news about the army attacking peaceful pro-Morsi protestors, think about this: the army gains nothing from attacking peaceful protestors. Only the Muslim Brotherhood benefits from portraying the army in such a demonizing light. And don’t forget, this is a group whose members are willing to sacrifice their lives in the name of God and their cause: to further political Islam. 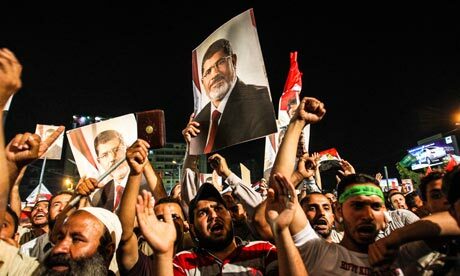 The Muslim Brotherhood may have been democratically elected (by a nation which had to chose a lesser of two evils) but they did not uphold the principles of democracy during their time in power.